The first time I washed Hannah's clothes with a Tide Pod instead of Ivory Snow liquid detergent I think I annoyed my Mom slightly. She loves the scent of Ivory Snow and was worried how Hannah's 18-month old skin would react to "normal" Tide. Full disclosure: I just wanted to do less laundry by throwing some of our items in together - and did not want to smell like a baby in the process (even if that scent is amazing). Avoid fragrances and or botanicals in your daily washing, soaps, detergents and moisturizers, as they can be both irritants and allergens. Test out a detergent like the new Tide Pods Free & Gentle. 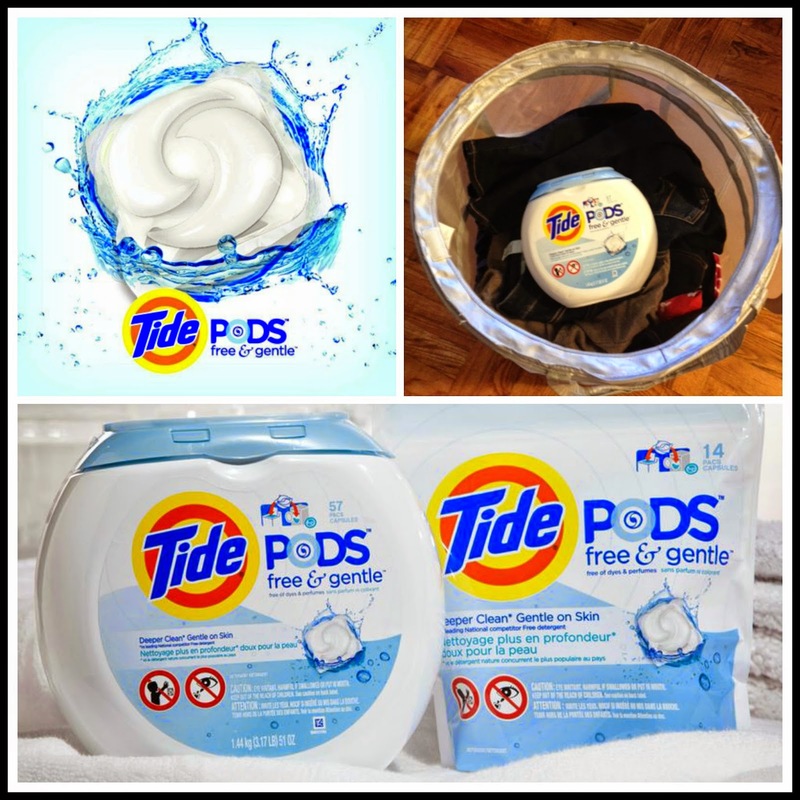 For people with sensitive skin seeking a detergent free of dyes and perfumes, Tide Pods Free & Gentle provides a deep clean that leaves behind no dyes or perfumes on fabrics, for gentleness on skin. Stick to non-foaming “soaps” in the shower. They do not strip the skin of its natural oils. Only shower or bath once a day. Water dries out the skin. Make sure that you keep bathing times to under 15 minutes and avoid using hot water. After bathing, pat dry. Rubbing your body with a towel will remove moisture and further dry out your skin. By entering the following contest you are accepting that if you win your contact information will be shared with a P&G PR and shipping agency for the purpose of mailing your prize. Please allow 4-6 weeks from the contest closure date to receive your prize. This giveaway may appear on other blogs as part of the #PGmom program. However, to be fair, you can only win once per giveaway. If your name is chosen more than once, another winner will be selected. All winners must be from within Canada excluding Quebec. Valid entries only. Contest ends November 17th, 2014. For further contest rules, refer to the Terms and Conditions within the Rafflecopter. I make sure I use an oatmeal bath twice a week to help with my flare ups. The winter time is lethal for my skin. Wash all new clothes before you wear them! I find that taking essential oils orally helps keep my sensitive skin from getting too itchy in the winter. Dutifully moisturize both morning and night to protect skin from the elements! Keep your skin covered up no matter what the weather. My sensitive skin tip is to moisturize often with a non-irritating cream. I use unscented face wash and lotion. Keep it moisturized with unscented lotion! Stay away from any soaps or lotions that are scented! Always read the labels and buy something that is scent free. use unscented soaps and moisturizers. My tip is to avoid products that contain fragrances. I use unscented products and like to hang my clothes on the line outside. Use more natural ingredients, and avoid fragrances in products. Definitely the least scented, the better. Keep your skin covered up in the winter. My tip is to use scent free products. My sensitive skin tip is to moisturize lots, and not to use harsh cleaners without gloves. I limit my use of anything scented for sure due to sinus issues!!! Make sure you pack your laundry soap for vacations/time away.. we forgot ours once..
Use unscented products and rinse everything twice. Try to avoid chemicals when possible. Use natural fibres as much as possible. use unscented products,or baby products are usually great also! Moisturize daily with an unscented/chemical free lotion. Try to stick with scent-free products. It would be great to win a P&G Sensitive Skin Laundry Pack. In response to your requirement to share my sensitive skin tip. My sensitive skin tip is use unscented soaps and moisturizers. I try to use unscented products whenever possible for my daughter's sensitive skin. dye free, scent free, chemical free and it's good for me! I use gentle fragrance free products. I use a humidifier so they air doesn't dry my skin out as much and use moisturizer twice a day. Try to go scent free and use natural products when you can. The best tip is to be aware of what you're using. We always have to read ingredients because my bf is sensitive to some chemicals. It's the biggest and best thing that helps. We like to use a humidifier in our house as it gets so dry here in winter and our skin gets dry and sensitive otherwise! Keep your skin moisturized with un scented lotions ! don't scrub your skin during washing. use dryer balls instead of dryer sheets. My sensitive skin tip - don't bathe daily, as it dries out your skin. Drink a lot of water and keep your skin moisturised throughout the dry cold winter months. Have warm, not hot, baths and showers. We use a lot of scent-free products. I make sure that I use a gentle soap when washing and mild scent free lotion.